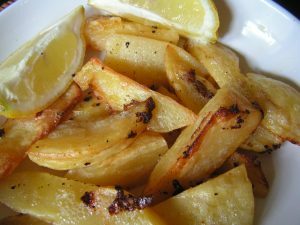 These lemon flavoured potatoes make an unusual side dish to grilled fish or meat. Pre heat the oven to 190C/Gas 5. Quarter the potatoes lengthways into wedges. Arrange them in a medium sized ovenproof dish and pour the lemon juice over them. Season to taste and dot with the butter or margarine. Pour the water into the dish and bake, uncovered for about 1 hour or until tender and lightly golden, basting at least twice during cooking.